This month’s pharmacist spotlight features Currus members Drs. Lisa and Tony Gales. The Gales are the owners of Main Street Pharmacy in Coldwater, Kan. 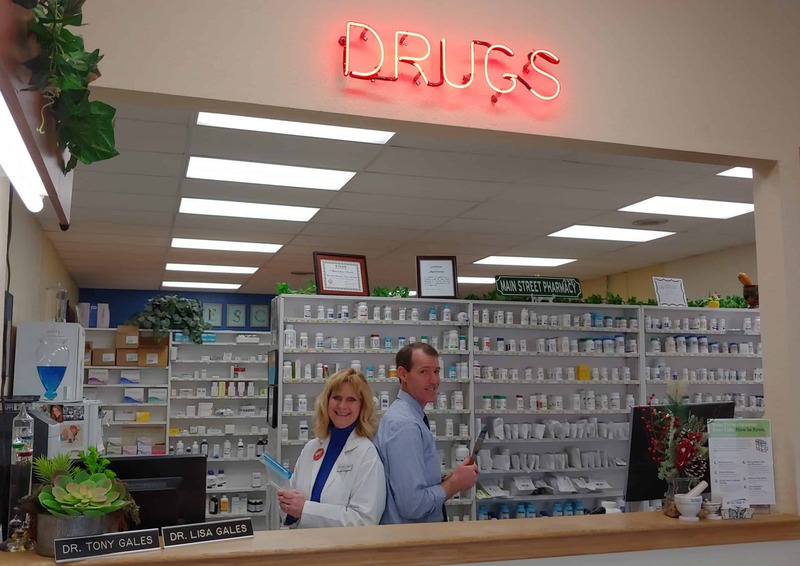 This is their story about how they came to be pharmacists and what motivated them to become independent pharmacy owners in a rural community. What made you want to become a pharmacist? Tony: I had two older brothers that were completing their pharmacy degrees. I realized if they could do it, then so could I! Lisa: Growing up on a farm, I always liked the science behind the medications that my dad would use to treat the livestock. I loved having the knowledge to make them better and save their lives. It was a natural transition. Now, I save people instead of animals. When did you realize that you wanted to become a pharmacist? Tony: When I was in pharmacy school doing rotations is when I realized the potential of a pharmacist. I could see the material we learned in the classroom being applied to help real patients solve healthcare problems. Lisa: I knew this was the profession for me when I was a freshman working at the pharmacy in our hometown of Kinsley and the pharmacist took a litter of kittens as payment on a child’s antibiotic. That human compassion and caring for others is what drew me into the profession. What made you want to become an independent pharmacist and run your own pharmacy? Lisa: I have always wanted to be the kind of pharmacist that cares for a small, supporting community like ours. I like being on the front lines and helping people. If you are not the business owner, then you cannot care for people like you truly want to and really make a difference. You are also able to have fantastic working relationships with the other practitioners and healthcare services in your area. We chose Coldwater primarily because of family. We wanted to be close to our families and to raise our daughters in a rural community. Tony loves the hospital and clinical side of pharmacy and he still gets to do this part at our local hospital. He loved us enough to go on this wild adventure with me and now he is glad he did. What do you find most rewarding about working in an independent pharmacy? We both feel the most rewarding parts of pharmacy are those big home run moments where you really make a difference or save a patient’s life. When we discover something, however big or small, that can make all the difference in the world for a patient and their family, it’s always an awesome feeling. Being independent pharmacists in a smaller community allows us to have that feeling daily because we truly know our patients. We are able to prevent a lot of healthcare issues that way. Independent pharmacies get to do it all. We provide regular pharmacy services and disease state management, but we get to provide services like compounding, immunizations, teach pharmacy students, negotiate our own contracts, and consult long term care, hospitals, and health departments. Every day there are new challenges and opportunities. It keeps life pretty exciting! What advice would you offer to those still in pharmacy school or those considering becoming a pharmacist? Pharmacy is a wonderful and respected medical profession. We get to make a huge difference in patients’ lives every day, and often that has nothing to do at all with medication. Be a pharmacist if you have empathy and compassion for your fellow man. Be a pharmacist if you have a love of healing and making the world a better place. It is important that you have that inside you because some days you will be working for free or wondering why you spent all day on the phone arguing with an insurance company. If you want to be an owner, take some time in school to pick up a few business classes in between all the clinical ones or you will be learning some lessons the hard way. Surround yourself with a wonderful support staff that shares your passion. You need to realize that the hard work you put in during school is training you for some really long hours at work and being on call 24/7. This is not a 9 to 5 kind of job. Tomorrow, you will get up and do it all over again, because you are a pharmacist and your patients need you. You would not have it any other way. ← Everything Old is New Again?